This Project has been a dream of mine for my entire musical career. Since the first time, around twenty-five years ago, that I first heard Freddie Hubbard’s album ‘Ride Like the Wind’, it has been my ambition to record an album with large ensemble…rhythm section, woodwind and strings. In many ways, everything I have done up to now…the music I have played, listened to, the way I have developed as a jazz musician, the people I have played with has all led to this point. Dr. Linley Hamilton (Lecturer in Music at Ulster University and BBC Radio Jazz broadcaster), releases the album ‘In Transition’, which features an extension to his line-up from the ‘Taylor Made’ album of 2011. The album has been well received with concerts around the UK and Ireland, as well as collaborations with John Hondorp and Markus Strothman in Holland and Germany. 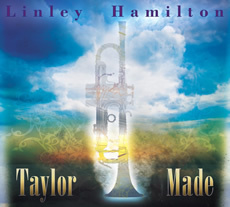 Belfast Trumpeter Linley Hamilton, Doctor of Music (Jazz) from Ulster University Magee, steps across to the other side of the fence and releases ‘Taylor Made’ on LYTE Records.